Bandelier encompasses nearly 33,000 acres of canyons, mountains, and mesas and is home to hundreds of prehistoric archaeological sites. The most popular and accessible ruin is Tyuonyi Pueblo in Frijoles Canyon. This large, circular, two-story structure was occupied from the 1100s to the 1500s by ancestors of the modern day Pueblos of Santo Domingo, Cochiti, San Felipe, Santa Clara and San Ildefonso. Just up the trail from Tyuonyi are numerous cave dwellings carved into the canyon’s sheer walls of volcanic stone. Many spectacular petroglyphs also are visible from the trail. Most of the Main Loop Trail is an easy walk and much of it is handicapped accessible. 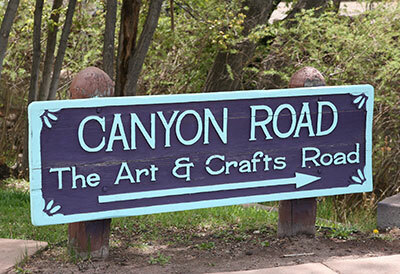 Santa Fe is a world-renowned art destination, and Canyon Road is the center of Santa Fe’s art community. You’ll find more than 100 galleries, studios, and unique specialty shops in the space of just six blocks. Along the way, enjoy the many well-preserved examples of historic adobe architecture that give Santa Fe its legendary southwestern charm. Break for lunch at any one of the six restaurants ranging from the tiny Café des Artistes to the casual luxury of The Compound, one of Santa Fe’s most celebrated restaurants. Parking on Canyon Road is notoriously difficult, but here’s a tip: Arrive before 10 AM and you’ll have your choice of free, on-street parking. In a city famous for its Spanish and Pueblo style adobe buildings, St. Francis Cathedral seems an anomaly. Built 1869 – 1887 in the French Romanesque style, its architecture was an intentional departure from local tradition on the part of Archbishop Jean Baptiste Lamy who preferred things French. The Cathedral stands on the site of two earlier parish churches, the first destroyed in the Pueblo Revolt of 1680 and the second torn down for the Cathedral. A remnant of the second church is now part of the Chapel of our Lady of the Rosary. The Chapel houses a revered statue of the Virgin Mary that was brought to Santa Fe in 1625 and survived the Pueblo Revolt by being carried to safety in El Paso by the Spanish refugees. This jewel contains the largest public collection of O’Keeffe’s work in the world, and is the first museum dedicated to an individual woman artist. It’s a small museum with a large impact. In addition to showing O’Keeffe’s paintings and drawings, the Museum mounts special exhibitions that feature modernist work by other important 20th Century artists. The Georgia O’Keeffe Museum Research Center is dedicated to the study of American Modernism (1890s to present) and sponsors research and education programs in the fields of art history, architectural history and design, literature, music, and photography. The Museum closes between special exhibitions: be sure to call ahead for dates. When you call, also inquire about tours of O’Keeffe’s home in Abiquiu, NM. The small-group tours fill up fast, but it’s an experience you won’t forget. The Pueblos of northwestern New Mexico are among the oldest continuously inhabited communities in the United States. Modern day Pueblo peoples are descendants of the Anasazi who built Mesa Verde and Chaco, and the Mogollon people from southern New Mexico. The two oldest Pueblos, Acoma and Taos, have been in their current location since the 1100s AD, and are the most spectacular of the villages, featuring clustered, multi-story adobe dwellings. Many Pueblo craftspeople sell jewelry, pottery and other traditional artwork out of their homes: just look around the villages for the “open” signs. No matter which communities you visit, you are sure to get a glimpse of other times and cultures that you will never forget. In 1852, five members of the Sisters of Loretto arrived in Santa Fe with the mission of opening a school for girls. By about 1870, Archbishop Lamy thought the Sisters needed their own chapel, so the industrious nuns set about raising funds and hired the French architects, Antoine and Projectus Mouly, who were still at work on Santa Fe’s Cathedral of St. Francis. Completed in 1878, the Sisters’ Gothic Revival gem was more refined and stylish than almost any other structure between St. Louis and San Francisco. The most popular feature of the Chapel is the elegant spiral staircase leading to the choir loft. The legend of its saintly origin stretches credulity past breaking, but is still fun to hear. And, though mere mortals have been building unsupported spiral staircases for centuries, this one is still a work of art. MoCNA is the best place in the U.S. to see new directions in contemporary Native American fine art. It primarily shows the work of students, faculty and alumnae of the Institute of American Indian Art, the country’s premiere art school for Native Americans. The Museum strives to bridge the divide between traditional and contemporary Native art, and to offer new definitions of Native art that reflect its diverse cross-cultural influences and complex historical development. The exhibitions at this recently renovated facility certainly defy stereotypes and will introduce you to exciting new trends and ideas in the world of contemporary art. In a curious bit of irony, MoCNA is housed in the Spanish-Pueblo Revival Style former Federal Building and Post Office, built in 1921 and incorporating Pueblo mission church replicas in its façade. MIAC is dedicated to presenting the history of Native American art and craft of the Southwest. The core, permanent exhibition, Here, Now, and Always, tells the stories of our region’s oldest communities from pre-history to the present. Voices of fifty Native Americans—augmented by 1300 artifacts—guide visitors through the stories, lives and landscapes of the Southwest’s indigenous peoples. A second permanent exhibit of Pueblo Pottery is an excellent introduction to pottery types and designs, and is a must for the beginning collector or anyone interested in the craft. MIAC also hosts a variety of temporary exhibitions on Native arts of the Americas, past and present. Be sure to stop in the Colleen Cloney Duncan Museum shop for an excellent selection of contemporary Native-made items. MOIFA houses the world’s largest collection of traditional folk art ranging from dolls, puppets and masks to textiles, ceramics and painting. Its three main wings include: Hispanic Heritage featuring objects from across the Americas; The Neutrogena Collection of exquisite tribal textiles and objects; and The Girard Collection, an astonishing assemblage of all things hand-made, whimsical, and charming. Altogether, the cultures of more than 100 countries are represented in life-size interactive exhibits, cultural festivals and hands-on activities for families and children. The International Folk Art Market is a must-do event that takes place at the Museum in mid-July. Better known as The Museum of Fine Arts, this historic museum contains an outstanding collection of work by New Mexico artists from the beginnings of the Taos and Santa Fe Art Colonies right up to the present. It also features a variety of special exhibitions of historic and contemporary art from around the country. The Museum is housed in one of the most architecturally significant buildings in Santa Fe, considered to be the first fully developed example of the Spanish-Pueblo Revival or “Santa Fe Style.” Built in 1917, the structure incorporates a replica of the mission church at Acoma Pueblo into its Palace Avenue façade and the Laguna Pueblo mission on the Lincoln Avenue side. St. Francis Auditorium, at the west end, recreates the interior of a Franciscan mission church, complete with carved vigas (beams) and herringbone latilla ceiling. Murals in the Auditorium, painted by early Santa Fe artists, recreate mythic scenes from the life of St. Francis of Assisi, patron saint of Santa Fe. Palace of the Governors is the oldest public building in continuous use in the United States, although it has been greatly rebuilt and modified over the years. Originally built by the Spanish in 1610, it was the seat of colonial government for what was then the northern-most reaches of Mexico and is, today, the American Southwest. Palace of the Governors is now a museum of New Mexico history with a variety of permanent and changing exhibits. Be sure to check out the Native American craftspeople selling their wares on the front portal of the Palace. All vendors are registered tribal members and the Museum of New Mexico carefully regulates the program, ensuring authenticity of materials and craftsmanship. Directly behind the Palace on Lincoln Avenue stands the New Mexico Museum of History, opened in 2009 as the first facility in New Mexico dedicated to the history of the entire state. The permanent exhibition, Telling New Mexico, recounts more than 500 years of stories from pre-historic Indians to current residents. The museum also hosts changing exhibitions and includes the Cowden Café with its sunny terrace overlooking buildings on the Santa Fe Plaza. This rustic little adobe church was built about 1710 on the foundations of a 1620s church that was destroyed during the Pueblo Indian revolt of 1680. Because of the early date of its founding, San Miguel is commonly called the oldest church in the United States. That’s a matter of interpretation, but don’t let the bit of tourist hype dissuade you from a visit. The history of the building is fascinating and the small collection of antique Hispanic religious art is well worth your time. In Spanish colonial times, San Miguel was the heart of Santa Fe’s oldest residential neighborhood (and truly one of the oldest in the US), Barrio de Analco, which housed Mexican Indian laborers who worked for the Spanish government and Catholic church. Since pre-historic times, local peoples have cultivated the fertile valleys of Northern New Mexico. Today’s farmers produce a much greater variety of food than the corn, beans, squash, and turkeys of their Native predecessors, and more than 100 of these modern family farmers now make their bounty available at the Santa Fe Farmers Market in the Railyard. The SFFM is one of the most widely celebrated markets in the U.S. due to its strict standards for local origin and high quality. All produce is grown in Northern New Mexico and sold at SFFM by the people who grew it; no reselling is permitted. Even the craft products offered by many vendors contain no less than 80% materials that are locally produced. Not planning to cook during your visit to Santa Fe? Stop by the Farmers Market anyway to enjoy the festive atmosphere, peruse the crafts, sample the baked goods, and take home a jar of local honey or jam. SFFM is held Saturday mornings year-around and Thursday afternoons from June through early October. You can find more things to do on our Northern New Mexico events page.